"You’ve all heard the tale. Young princess has an evil Queen of a stepmother. Young princess is truly beautiful, the fairest of them all. Evil Queen gets jealous. She wants her out of the picture. Etc, etc, etc. The story is all wrong. Or at least, most of it is wrong. Like all stories, it’s been told over and over again, far and wide. And of course, the details change. They’re lost in translation. This is what really happened." 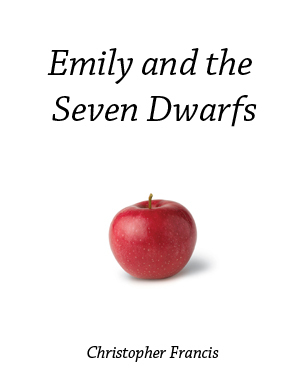 Emily and the Seven Dwarfs is a postmodern retelling of Snow White in an approach similar to Angela Carter's The Bloody Chamber. Darker than the Disneyisation, Emily and the Seven Dwarfs explores the original tale steeped in the lore created through all the different versions of Snow White to create this, the ultimate version.